THE FED IS PLANNING MOVES THAT WOULD more than double its balance-sheet assets by September to $4.5 trillion from $1.9 trillion. Whether expressing approval or concern over the fed’s intentions, most commentators fail to understand the real magnitude of the projected expansion of the US monetary base because they don’t take into account the amount of dollars circulating abroad. At least 70 percent of all US currency is held outside the country, and this means the US monetary base is considerably smaller than the Fed’s overall balance sheet. Take, for example, the true US domestic money supply at the beginning of September 2008, before the fed started its quantitative easing. From the Federal Reserve’s website, we know that currency in circulation was 833 Billion. This translates as 583 Billion dollars circulating abroad (70 percent), and 250 Billion dollars circulating domestically (30 percent). Since the bank reserve balances held with Federal Reserve Banks were 12 billion, that gives us a 262 Billion domestic monetary base as of September 2008. Now compare that to the projected US domestic monetary base for September 2009 which is 3,818 billion (4,500 billion – 583 billion (dollars circulating abroad) – 99 billion (other fed liabilities not part of the money supply)). The fed’s planned balance sheet expansion results in a 15-fold increase in the base money supply. 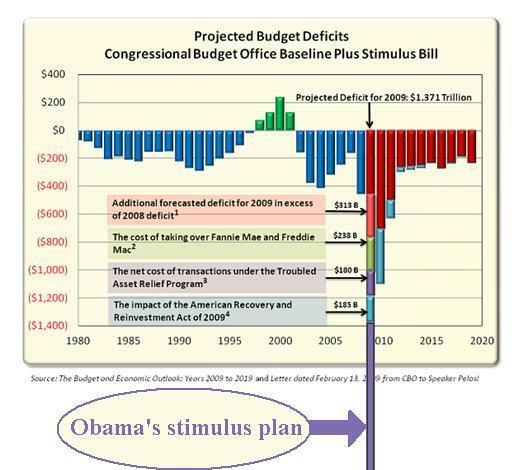 This 15-Fold Increase will be impossible to reverse. A) Selling toxic assets at a loss could become a crippling source of major embarrassment for the Fed, undermining its authority. For example, last year when the Fed took 29 billion toxic assets to help JPMorgan’s takeover of Bear Stearns, it assured Americans that by holding those securities till maturity, the cost to taxpayers would be minimal. If the Fed sells those toxic Bearn Stearns assets at a catastrophic loss, it would cause fury and outrage from voters and lawmakers. B) Selling assets at below book value will quickly cause the Fed’s equity to turn negative. The Federal Reserve would then need to be recapitalized by new debt from the treasury, which would increase the national debt. On top of all the issues above, the Fed’s woes are going to be compounded by upwards pressure on the yields of treasuries and other US debt. This upwards pressure will likely force the fed to monetize far more treasuries than the planned $300 billion purchases it has already announced, and will greatly complicate any efforts by the fed to control the money supply. The biggest force pressuring treasury yield upward is without a doubt the trillions of debt the treasury has to sell to finance the enormous 2009 budget deficit. There is nowhere near enough buyers to absorb this supply. The graph below demonstrates the challenge facing the treasury in funding this year’s budget. Foreign central banks will be selling off their treasury foreign reserves. Saudi Arabia, for example, is projecting a 2009 Budget Deficit, which it intends to finance by selling off its US holdings. Russia, meanwhile, has already sold over 20% of its $598.1 billion reserves, and India’s central bank has been forced to sell off its US holdings to curb its currency’s decline, and its total reserves have decreased by $62.2 billion. Japan, which is now running a record current account deficit, can also be expected to sell treasuries. The steady accumulation of treasuries by government retirement funds has helped absorb the supply of treasury bonds for over three decades. This accumulation of government debt to secure the retirement of baby boomers helped drive down treasury yields and fund deficit spending. These higher risk premiums are the result of reversing the process by which credit-default swaps were leveraged up and packaged into investment vehicles. To juice returns, these synthetic CDOs disproportionally insured the riskiest AAA rated debt, such as Lehman’s bonds. Synthetic CDOs are estimated to have sold insurance on between $1.25 trillion to $6 trillion worth of bonds. CDPPs are another group of specialized funds which work exactly like synthetic CDOs and CPDO funds, except for one key difference: they used an insane amount of leverage, as much as $80 for every dollar invested. CDPP funds together with subprime CDOs squared are finalists for the title of “most idiotic financial instrument ever created”. So, if you can find a cheap enough cost of capital, a safe enough destination, and you have the credit to borrow large amounts of money, you too could make enormous profits in carry trades. The notorious gold carry trade is based on the exact same idea. Elite money-center bullion banks were given sweetheart opportunities to borrow central bank physical gold at 1%, sell it in the open market, and immediately invest the proceeds in higher yielding “safe” investments and reap vast profits. It seemed like a no-brainer. The central banks got to squeeze a yield from their gold. The borrowers got to sell the gold on, and use the proceeds to fund more exciting investments like 10-year US Treasuries yielding 4% per year or so. Yes, these ‘carry trade’ returns were tiny. But the cost of borrowing gold was tinier still. The recipe for a shortage has been carefully followed. A few finishing touches may be required before a market epiphany. There is no known reconciliation between paper and physical positions, and none will be attempted until after the squeeze. The weakness of credit analysis and supervisory oversight, as well as the many ambiguities in the linkage between paper gold and physical can flourish only if there is supreme confidence in gold’s permanent downtrend. The trust and confidence essential to balance the gold derivatives pyramid depends on three critical errors: that mine reserves = physical gold; that gold receivables = gold on hand; and that financial markets will enjoy smooth sailing indefinitely. Trust is nothing more than a state of mind. When this levitation is finally exposed and its illusions shattered, it is ludicrous to think the imbalances can be corrected by a small rise in the price and within a comfortable time frame. Expect the resolution to be swift, furious, and uncomfortable for those caught short. Despite managing to “get the gold price under control”, US/UK bullion banks (JPMorgan, HSBC, etc) have been stuck on the short side of gold ever since. Make no mistake, gold prices have been suppressed, but calling this process a “conspiracy” would be inaccurate. Gold suppression by the US and UK is better characterized as a desperate cover-up. Furthermore, while a side affect of the gold carry trade and gold suppression was to drive down interest rates, that was never their intended effect. A desire to hold interest rates would not have been enough to push the fed or the Bank of England to manipulate gold prices. It was only the threat of the total collapse of US/UK financial system which prompted the suppression of gold. The unwinding of the gold carry trade would have (and will) dragged down the some of the biggest US/UK banks under (JPMorgan, HSBC, etc…) and that was what had to be prevented at any cost. Stay away from any form of paper gold: GLD (HSBC is custodian), gold pools and unallocated gold accounts, gold futures, etc… Paper gold investments are guaranteed to default before this crisis ends. Furthermore, now that the fed has begun creating money at an accelerating rate, the extensive foreign holdings of US currency might exacerbate the effects of inflation fears. As foreign dollar holders’ confidence in the dollar is eroded, they will trade their dollars for alternate stores of value (yuan, euro, gold, etc…), potentially sending a flood of currency back to the US. If the Fed failed to reduce the supply of currency to counteract dollars being unloaded from abroad, the inflationary consequences would be made worse as the mass reversal of currency flows from foreigners to the US becomes overwhelming. 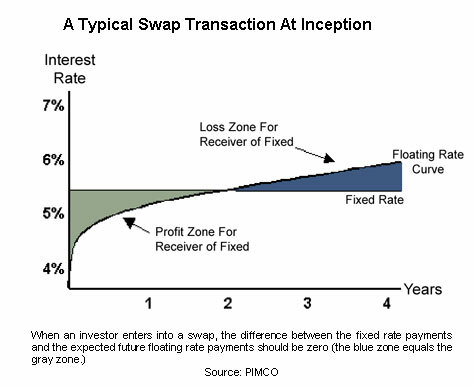 Interest Rate Swaps create demand for bonds because bond trades are implicitly embedded in these transactions. 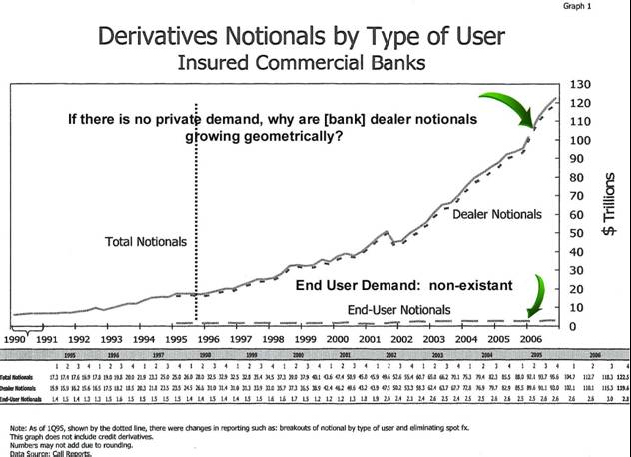 Without end user demand for the product – trading for “trading sake” creates ARTIFICIAL demand for bonds. This manipulates rates lower than they otherwise would be. In the case of J.P. Morgan in particular (forgetting about the lesser obscenities at Citi and B of A), their interest rate swap book is so big that there are not enough U.S. Government bonds being issued or in existence for them to adequately hedge their positions. This means that the obscene, explosive growth in interest rate derivatives was all about overwhelming the long end of the interest rate complex to ensure that every and any U.S. Government bond ever issued had a buyer on attractive terms for the issuer. Concurrent with the neutering of usury, the price of gold was also “capped” largely through Fed appointed banks “shorting gold futures” as well as brokering gold leases [sales in drag] sourcing vaulted Sovereign Central Bank gold bullion. The gold price had to be rigged concurrently because historically, according to observations outlined in Gibson’s Paradox – lowering interest rates leads to a higher gold price. Gold price strength is historically synonymous with U.S. Dollar weakness which leads to higher financing costs or the possibility of capital flight. In a currency collapse (which is where we are headed with Bernanke’s 15-fold increase in the money supply), interest rates follow inflation to astronomical heights. Loans run for 24 hour periods. Interest rates in the five or six digits range are common in hyperinflation, and, should they occur here in the States, anyone “short the swap” (the floating-rate payers in interest rate swaps) will be crushed into oblivion. At least with credit default swaps, there is a limit to how much investors can lose. European banks increased their dollar assets sharply in the last decade which helped drive down US interest rates and absorbed a large portion of America’s growing debt. Their combined long dollar positions grew to more than $800 billion by mid-2007. This $800 billion was then leveraged into $8 trillion in US assets. The low capital ratios of these dollar positions were acceptable to regulators because European banks are allowed to apply a lot more leverage as long as they are buying exclusively AAA rated securities. The other is the loss of their dollar funding. The enormous leverage employed by European banks to purchase toxic AAA rated assets was funded in great part by loans from US money market funds. After Lehman’s default led to massive withdrawals from those money market funds, European banks lost access to billions in dollar funding. The sheer size the Fed’s monetary expansion and the dollar’s fall will soon increase both inflation and inflation expectations. 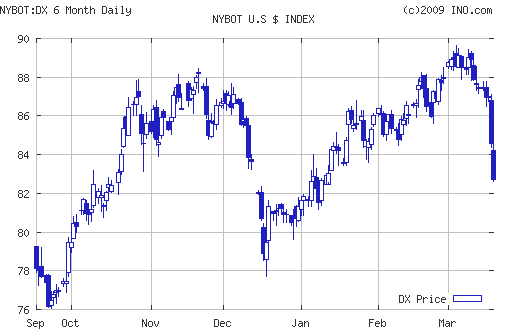 This in turn will put upwards pressure on treasury yields. During the last three decades, long-term interests rates have fallen steadily in US, as demonstrated by the chart below.